The Red Sox have gone out and acquired their second basemen. Dave Dombrowski dealt for Ian Kinsler late Monday, sending the Angels minor league pitchers Ty Buttrey and Williams Jerez. Kinsler will step up into the starting role at second, relegating Eduardo Nunez and Brock Holt back to more utility style roles. Nunez will likely get some time at third until Rafael Devers returns from the DL, but will feature less after that. The acquisition of Kinsler gives the Sox upgraded stability at second. Although his average has suffered over the last two years, Kinsler has more pop in his bat than Nunez, with 247 career home runs to his name. He also is a former gold glove winner (2016) with a lifetime .981 fielding percentage. He joins the Red Sox with a 2.0 WAR rating on the season, per FanGraphs. Although his batting average for the season is at a career low, Kinsler has heated up as of late, with a line of .320/.393/.467 line for July. 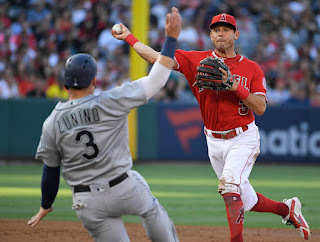 Kinsler should be the starting second basemen for the rest of the season, though he may face a battle for the role if former Arizona State teammate Dustin Pedroia can recover fully from his offseason surgery. The trade also adds another veteran presence with postseason experience to a relatively young lineup. Kinsler had two trips to the World Series with the Texas Rangers in 2010 and 2011, and has hit .291 with an impressive .400 OBP in his postseason career. Although the acquisition of Kinsler might fill a role that could potentially be recovered by Pedroia late in the season, this is a pretty low risk trade for the Red Sox. Acquiring Kinsler required much less output from the Sox than acquiring Brian Dozier or Scooter Gennett would have, and his adjusted salary for the Sox for 2018 is under $2 Million. Look for Kinsler to make a solid contribution to the lineup, while providing added stability to an already strong defensive core. Kinsler will begin his journey with the Red Sox tonight against the Phillies, and will be batting sixth in the lineup.